From the desk of Stu Harman, our support and coaching expert. In this article Stu explains how you can share information between multiple BiteFX software installations in your office. The default Option setting for Information Sharing is to not share information. You'll start by creating a folder on a shared network drive to which your BiteFX computers are mapped. Creating the folder on a shared drive is required for the information sharing process to work. Once the shared folder had has been created, you will then enable information sharing on each installation of BiteFX that you want to share the information, and also set the information categories each BiteFX will be allowed to share. Navigate to a suitable network drive that your BiteFX computers are mapped to access (you may want to check with your IT specialist to select or set up the shared drive). Create a new folder and name it appropriately, for example "BiteFX Information Sharing". Start BiteFX and click on the Menu button, then select Options from the menu list. In the left column of the Options menu, select Information Sharing. 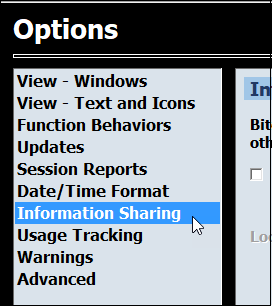 Click in the box to the left of the text "Use information sharing" to enable it. Click on the Browse button on the right side of the Information Sharing window. Navigate to the information sharing folder you created, click on the file name to highlight it, and then click on "Select Folder". Select which information sharing categories you want the BiteFX software to share with others. Once Information Sharing is enabled, the default is for all of the information categories to be shared, as indicated by the checked boxes next to each of the three categories. When finished, click on the "OK" button at the lower right corner of the Information Sharing window to complete the setup. On each additional BiteFX computer you wish to enable information sharing, start the software and repeat steps 1-8 in Configure Information Sharing On the First Computer. Remember that you can choose what, if any information each copy of BiteFX will share independently, so they don't need to be configured the same way for every BiteFX. Every BiteFX computer that has been enabled to share information will now be able to a) overwrite the share file or b) accept the changes made by another BiteFX computer. Overwriting the share file occurs when you close BiteFX. There are four (4) share scenarios, two of which will produce a warning dialog that allows you to select whether to overwrite the shared file from your local computer or not. No changes have been by anyone on any computer – the shared file is unaltered and no warning dialog appears. Changes have been made by the local computer, but no changes made by any other computer – the shared file is changed but no warning dialog appears. Click on "Yes" to allow the share file to be over-written by your computer, "No" to preserve the changes made by the other computer, or "Cancel" to abort closing BiteFX. Click on "Yes" to allow the share file to be over-written by your computer, "No" to lose your changes and keep the changes made by the other computer, or "Cancel" to abort closing BiteFX.